VISUAL STORYTELLING. BUILD YOUR VISION WHILE DEVELOPING SPECIFIC NARRATIVE SKILLS. With ICP Masterclasses in Visual Storytelling, you'll learn how to tell a refined story, develop a “media kit” stocked with both technical and artistic tools, seamlessly edit and sequence imagery, and explore best practices for approaching subjects through ICP’s new global reach initiative. 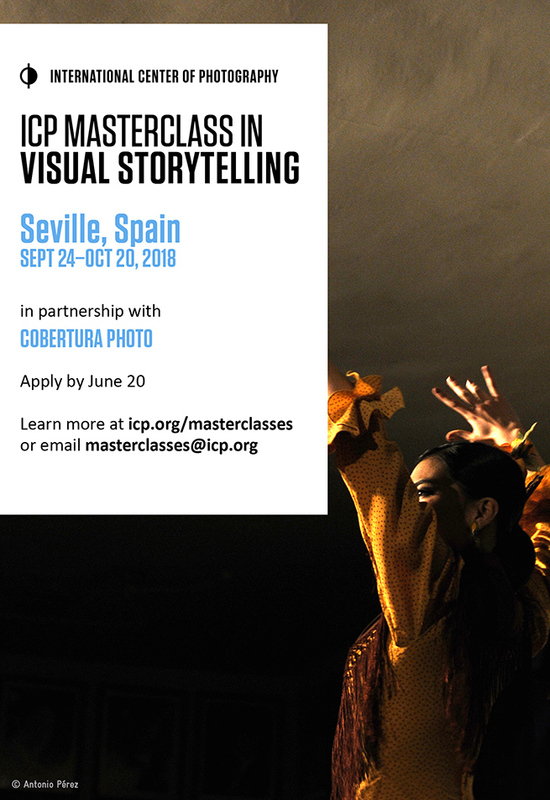 Each ICP Masterclass in Visual Storytelling is designed to guide you through consecutive stages of fulfilling a project idea, with the ultimate goal of creating a thought-provoking story. Along the way, you will find meaning in your work and discover informed communication strategies, which are key to any photographer’s success. Offered worldwide, these flexible courses, or “modules,” can be tailored to meet your needs. Prospective students may apply for any one-week module, a combination of weeklong modules, or an entire monthlong program. Each module may be completed at different sites across the globe. Discover a context to help frame your work. This course focuses on exploring themes and ideas by grouping, editing, and sequencing to make a coherent body of work. Through student-centered learning techniques and exercises, we work together to build an individualized storyline. You are expected to bring works in progress, and faculty will guide you to organize your workflow, timeline, and, ultimately, a basis for individual vision. The class includes optional one-on-one critiques with faculty. The Biennial hosts the best spectacles, classical and contemporary, and the city is also packed of varied events. Many attractive activities will develop around the spectacles. The Bienal will collaborate with the ICP Masterclass offering students facilities to shoot in rehearsals and a map of places and activities where students can also work on the topic. A perfect opportunity to deep in the flamenco world in the city where it was born. Requirements: 4x6-inch same-sized printed imagery and Adobe Lightroom software. Application requires a project idea, goal, and work in progress. Combining sound with images to create compelling multimedia stories generates a potent context for visual imagery. Using your work, archival research, samplings, and gathered materials, this class leverages Adobe Premiere Pro to frame and create a short trailer or multimedia story that exemplifies the power of voice. The art of making a good interview and recording involves a technique crucial to successful storytelling. Together, we practice with subjects and/or friends with recorders, microphones, and video. Requirements: Proficiency with Adobe Premiere Pro and Lightroom software; students must have working knowledge of Lightroom and have completed tutorials in Premiere Pro before the class begins. Application requires a project idea, goal, and work in progress. Learning to hear your own voice is more difficult than you may think; editing images becomes easier when you can clearly contextualize them; choosing and ordering your images affects the ways in which they are viewed. This course closely examines how to build a narrative visually, listen to pitch, and explore strategies that clearly communicate your vision. Through guidance, exercises, examples, critiques, and self-examination, students will discover ways to make sense of their visual worlds. Requirements: Adobe Lightroom and same-sized printed imagery; digital archive of all files—still, video, or audio. Application requires a project idea, goal, and work in progress. You have all the components of an unedited story—stills, video, audio, archival photographs—and now you just need to edit and slice them together. In this course, you will create a polished multimedia story on someone, someplace, or something you find interesting. By enhancing your editing skills in stills/video/audio, you will complete a full digital presentation ranging from 59 seconds to 5 minutes. Lectures on advanced media interactivity and best practices punctuate the week. Requirements: Students must have a working knowledge of Adobe Lightroom and Premiere Pro, and have updated versions loaded before the class begins. Students must bring an external hard drive archive of all vital elements to complete a multimedia story. Application requires a project idea, goal, and sample images or video. Students are required to have their own laptop, external hard drive, and relevant updated software. Each module is more advanced than the previous one, assuming certain technical abilities. Each module begins with an orientation and ends with a final class review. Each module includes lectures, exercises, and group critiques. All students receive one-on-one feedback from the instructor. Evening lectures address pertinent topics related to that module. Students will be individually observed through each module and grouped in an accelerated class for most of the program activities. Visit icp.slideroom.com to apply online (unless otherwise noted). Students may apply for any one-week module or a combination of modules. Application fee is $25 for one or all modules. Application requirements are stated for each module in the module descriptions. A letter of acceptance or decline will be sent by email within 30 days after the deadline.